Avengers: Infinity War's heroes take coffee breaks in-costume and Karen Gillan "cannot deal"
Subscribe: Grab a monthly subscription to Total Film magazine for the latest news, interviews, and features about the biggest films delivered straight to your (digital or physical) mailbox. "It doesn't get old! When they're all fully in costume, sitting around with their coffees, I'm like, 'No! I cannot deal with this!' It's the most surreal thing ever," Gillan said. "Then they will be talking about their costumes in a real practical way: 'The first suit is always tricky, because you're ironing out all the parts that don't feel comfortable...' Giving advice to other superheroes... it was very funny." Aside from the famous company, it also took Gillan a bit to reckon with the simple fact that she's going to be a part of this massive "cinematic event", the one movie that has arguably had the most sprawling lead-up of any in film history. 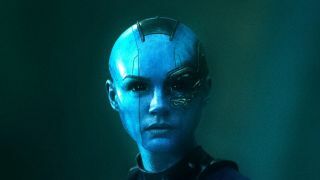 Especially because Nebula wouldn't have even lived to see Guardians 2, let alone Infinity War, if not for some late revisions. "I didn't think it was a plausible thing, to be honest," Gillan admitted. "The crazy thing is when I first signed on for the role, I thought it was going to be eight days of filming. And then I thought the character was going to die. Now five years later I'm in the Avengers! Woah! It's amazing. I love playing this character so much... I'm so invested in her, I want to see it through to the end." The Avengers are great and all, but you and I both know who the real star of the Marvel Cinematic Universe is - pay him proper tribute with our list of every Stan Lee Marvel movie and TV cameo. And don't forget to sign up for a subscription to Total Film for more interviews like this one.